Spirolox Retaining Rings can operate in an internal and external groove at the same time. Install the ring in one groove and then compress the ring with the mating component into the second groove. When the grooves meet, the ring snaps into place creating a low-cost, hidden, high-strength, tamper-proof rotating joint. Over 6,000 rings are stocked from 1/4” to 16” diameters in carbon and stainless steel, customs up to 120”. What is Electroforming? How does it actually work? Can your rooftop handle solar panels? What’s a million-mile Toyota Tundra worth? 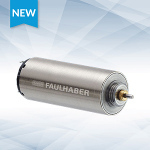 MICROMO launches the next generation of small DC motors: the 1024 SR series from FAULHABER. This coreless micro motor features a 10-mm diameter and offers high performance with small dimensions and low weight, making it ideal for high-demand medical applications and portable devices. Combined with a gearhead, its output torque can achieve 300 mNm, twice that of similar products. A superior torque/speed ratio means the motor can handle varying loads at reduced speed variations. The Defense Advanced Research Projects Agency (DARPA) is working to develop a back-up system to be used by service members in the event that access to the Global Positioning System, or GPS, is denied to them by adversaries. "We're focusing on naval surface and aviation ... and it's very applicable to Army helicopters," said Lin Haas, DARPA's Strategic Technology Office. 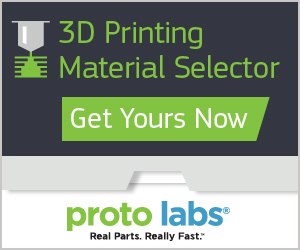 This pocket-size quick reference guide will help you identify the right materials for your next 3D-printing project. With advancements in prosthetics allowing fine motor control driven by a patient’s nervous systems, the use of miniature load cells placed at grip points helps observe a wide variety of operating conditions the patient requires from their prosthetic every day. Sensor specialist FUTEK runs through the basic setup. Rice University scientists have advanced their graphene-based de-icer to serve a dual purpose. The new material still melts ice from wings and wires when conditions get too cold. But if the air is above 7 deg F, ice won’t form at all. Piezo mechanisms provide high force, sub-millisecond responsiveness and excellent position stability. 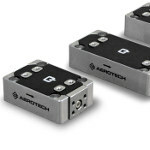 Flexure actuators are faster than magnetic drives and ideal for fast valve actuation, precision optical alignment, and nanopositioning applications. How sweet it is when you've got the right tools. For Vladislav Belyakov, the CEO of BOX39 in St. Petersburg, Russia, the tools that often make all the difference are his in-house design and milling capabilities. Belyakov pushes design and construction edges from fantasy land into the real world by customizing a bike into something recognizably cool, like an amazing cartoon that you can ride. In 2007, a new type of golf club hit the market. The distribution of mass in the club head made it less likely to twist, making an off-center hit less likely to send the ball veering off course. It did have one drawback, though: a loud noise when it struck the ball, "like a cookie tray hitting the top of a car." Servometer electrodeposited gold-plated (ASTM-N-488) bellows contacts create a reliable solution for electrical connections with less signal loss versus competing technologies. Servometer bellows contacts are a reliable alternative to spring-loaded type test pins in high-frequency test applications, and are designed to provide lifetime spring and force repeatability, in diameters as small as 0.020 in. 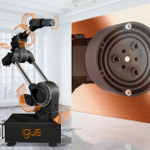 The Robolink D modular robotic kit from igus allows users to assemble custom robotic systems for a range of applications. Separate joints, which are motor-driven directly on the axis, are available in a range of installation sizes. A new, 6-axis arm with strain wave gearing (in two installation sizes) is also available, along with universal gripper adaptors. The gearing, available as an individual component or with integrated NEMA motor, consists of an outer ring gear and flexible, wear-resistant inner ring gear made from self-lubricating, wear-resistant iglide plastic. This solution offers minimal backlash and ensures a precise adjustment with incredible smoothness. Supershield 1000 Series is a silicone or fluorosilicone elastomer filled with conductive metal particles, providing both high EMI shielding effectiveness and an environmental seal. This family of unique sealing solutions from Tech-Etch uses eight basic conducting media, and durometers are available from 40 to 80. 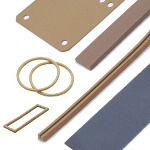 Supershield can be supplied in a variety of sheet sizes or as standard or custom die-cut gaskets. Standard extrusions include round, hollow round, rectangular, solid "D," hollow "D," and channel. The ability to maximize battery life and extend vehicle operations, essentially running “lean and mean,” is the key to keeping a vehicle operating at peak performance. 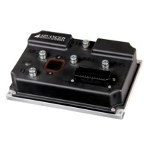 The DVC series motor controllers from Advanced Motion Controls are digital four-quadrant servo drives purpose-designed and built to operate today's modern mobile electric vehicular platforms. Providing high power from battery supplies, the DVC series features a compact design, IP65 construction, and multiple operating modes for controlling either permanent-magnet brushed or brushless motors in applications such as traction/propulsion, steering, and lifting. A new solar cell configuration developed by engineers at the University of New South Wales in Australia has pushed sunlight-to-electricity conversion efficiency to 34.5 percent -- establishing a new world record for unfocused sunlight and nudging closer to the theoretical limits for such a device. If you're going to lay down $400,000 for a new Ford GT, it's nice to know it comes with options. One impressive one, although it'll cost you, is carbon-fiber wheels to match the supercar's carbon-fiber exterior, which is pretty cool if that woven-fiber look is your thing when it comes to automotive styling and performance. Dynamic Group, a Minnesota-based contract manufacturer, had difficulty staffing their injection molding production and wanted to make better use of their existing labor force. Three collaborative robot arms from Universal Robots have now taken over machine tending and kitting tasks resulting in improved product consistency and a 400% increase in production capacity for those applications. Watch how this was done. View the full range of collaborative UR robots. Locate a distributor in your area today. Electroplating may have been around for centuries but only Servometer® excels at manufacturing dynamic, convoluted bellows electroforms. Watch Servometer’s five-step electroforming manufacturing process and learn how they are able to deliver electroformed components that feature extreme tolerances, complex geometries, lightweight construction, structural strength, and how they can be applied to a variety of applications.